The Gate is a premium pub and restaurant in Chorleywood, Hertfordshire, that has recently been revamped. I was invited to visit and sample the new menu which was launched earlier this year. If you haven’t been to Chorleywood before, it is around a 45-minute drive from North Herts, easily found at junction 18 of the M25 (even for me, and I’m terrible with directions!). Chorleywood is a small Hertfordshire village with beautiful houses, a golf course and the lovely green space of Chorleywood Common. 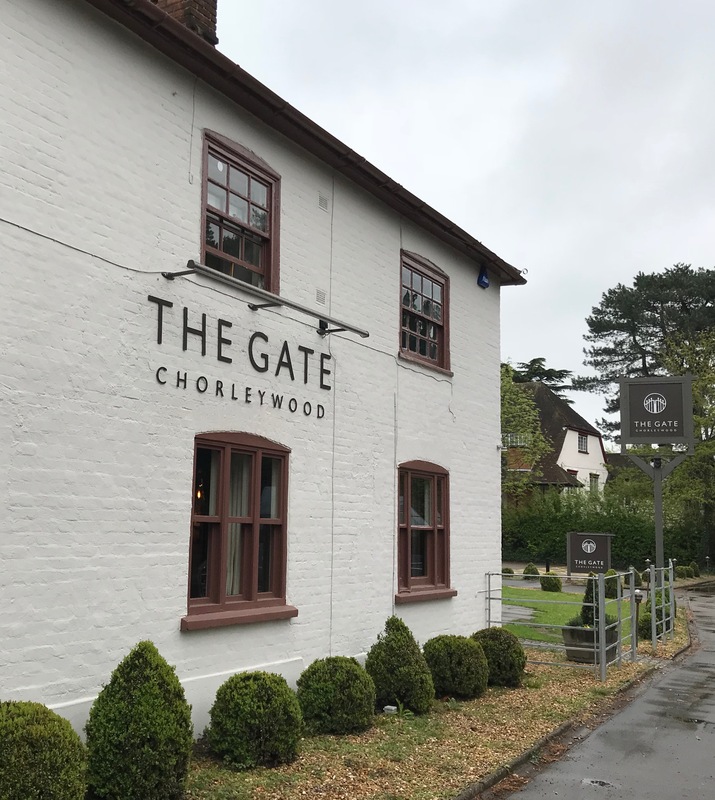 I have a friend who lives in Chorleywood and The Gate is actually one of her locals, though she hadn’t visited since the revamp. I arranged to meet her there for lunch, so that she could share some insight into how much it has changed. The pub has separate bar and restaurant areas. There is also a good-sized, well-kept garden with comfy-looking furniture. I think this would be really lovely in the sunshine (unfortunately we visited on a rainy day, hence the rather grey photos!). The interior is really smart. We ate in the restaurant which is very plush. A mixture of booth-style seating with traditional tables, it has quite an intimate feeling to it which makes it feel a bit special. There was a group of girls celebrating a birthday while we were there, which shows that locals are happy to book here for special occasions. My friend is pregnant and I was driving so unfortunately we had to stick to non-alcoholic drinks but there are several virgin cocktails to choose from. We went for Virgin Pornstar and Mojito and both were lovely and refreshing. I didn’t even miss the alcohol to be honest! The new menus were introduced this year and are really comprehensive. You’ll find classic pub food, pizzas, sandwiches and salads, fancier mains, specials, plus a dedicated vegan menu. It’s family-friendly so there is also a children’s menu. To start with, we chose artisan rustic breads with oils, olives and flavoured butter (the bread was served warm which was nice). Our mains were pan-fried sea bass fillets and oven-roasted snapper fillets. They were both excellent and good-sized portions. My friend and I agreed that sometimes fish dishes in a pub can be a little dry but these were restaurant quality and very tasty. Both dishes were beautifully presented as well. For dessert, we chose dulce de leche lava fondant and melting golden chocolate orange bomb. Both were melt-in-the-mouth deliciousness and again, very pretty to look at. Well, for about five seconds before we got stuck in. The staff were friendly and attentive and overall, we had a fantastic time. Our bill came to about £65 for the two of us, not including a tip. My snapper fillets were from the specials menu, so cost a bit more. We wouldn’t normally eat this much at lunchtime – it was really more of a dinner! Has the revamp been a success? Absolutely. According to my friend, this revamp was needed. It has made The Gate much more attractive for a special meal out, thanks to its extensive new menus and smarter interior. The Gate does seem to be able to cater for all. You can have a relaxed drink and bite to eat in the bar, a date night or meal with the girls in the restaurant, or a relaxed Sunday chilling out in the garden with the kids. I’ll definitely plan to come back – hopefully on a sunnier day when I can try out that lovely garden! You can visit The Gate’s website here. Have you been to The Gate? What did you think? Please share your comments below. Disclaimer: Mums Off Duty received a gift voucher for The Gate in exchange for a review. My reviews are always completely honest.